Cold Fire is currently a dormant flag on the Cerulean Ocean originally of the Midnight Ocean. Yar! This be Cold Fire; Reforged, Remade and Rebuilt! We be the rightful heirs of Moonlighting and are looking to become that of what we once were! So welcome aboard and join us for Fame, Fortune and silly Shenanigans! We are Cold Fire! A group of Pirates steeped deep in history who trace their roots as far back as the beginning of Midnight to as recent as the current date! We have succeed in this ocean and we plan to be one of the best flags once more! We are a fun, exciting, and active place to be. We have learned to grow and adjust to changes within the ocean as well as our flag! We are the rightful heirs to Moonlighting and as such have inherited their leadership talents, strengths and codes of honor! Calm, Cool, Collected; through the flames of battle we have persevered. We are an ambitious flag looking to grow with the right crews. 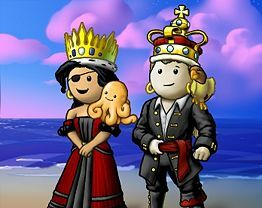 We are currently Open for Crew's and Ally's wishing to join us please contact any of the Royal's or Titled with yer inquiry of interest for applying to us! June 15, 2008 - Cold Fire disbands following a merge with the flag Don't Panic. August 4, 2009 - Cold Fire is reborn under the fine leadership of King Lial and Villains of the Amazon Captain Chandani. This page was last modified on 4 October 2016, at 15:52.